Note: There's a lot of rather large pictures on this page. So, please be patient, it might take a few minutes to load! 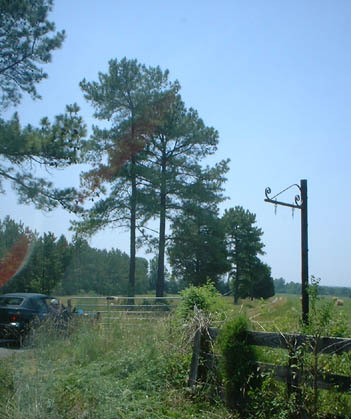 On Tuesday, June 11th, 2002, we travelled to Louisa County, Va. to do some genealogical investigating, seeing if we could find any records of our ancestors in the local courthouse, find the old family graveyard, find the old family house, and meet some cousins we'd never met before. My father, Dr. G. Comer Duncan Jr., and I had been in North Carolina visiting our family for the previous few days, and my aunt Mariam, my cousin Larie (Mariam's daughter), and Larie's two girls came along for the fun. We stayed in Charlottesville on Monday night and drove in to Louisa first thing on Tuesday morning. We found that the Louisa County courthouse contained all of the original deeds, all available for just pulling off the shelf and thumbing through. 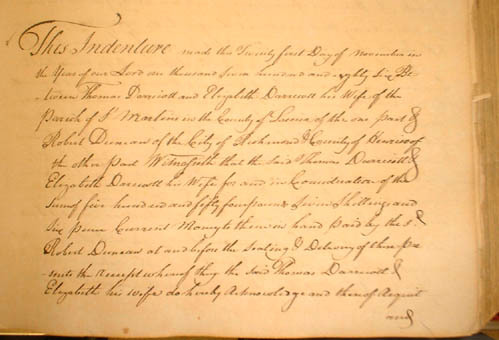 We were a little astonished that they'd let people just walk off the street and go through the original deed records from the 1700s, but we certainly didn't complain. 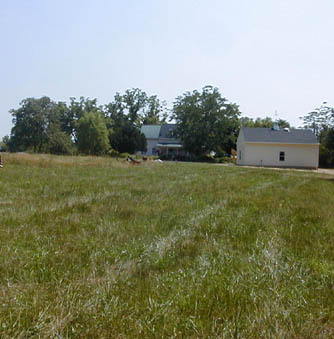 We only had time to go through a small number of them, but we found the original deed where the earliest Duncan ancestor of ours we know of, Robert Duncan, purchased 665 1/4 acres of land out in the county for his plantation (shown below). We took pictures of a few other deeds (which we will eventually transcribe and have available to look at right here), and then we all went to lunch across the street. After lunch, we headed out towards the very tiny town of South Anna, on the South Anna river in the southern part of the county. 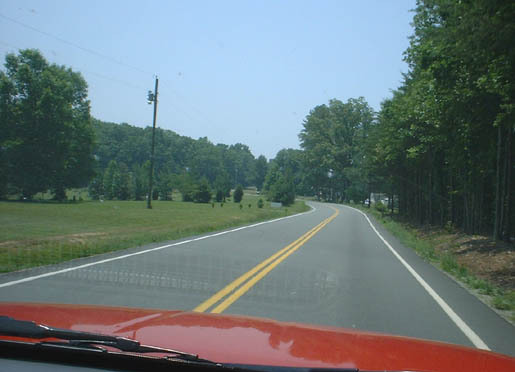 We quickly found that South Anna doesn't really exist, and is just a crossroads where a sawmill sits. 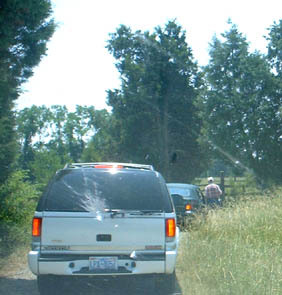 We waited at the sawmill for our cousins and, after they showed up, we headed out towards the site. 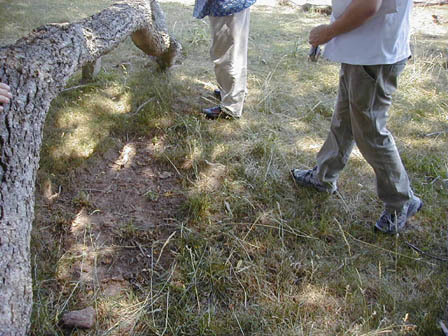 Our cousins, Doc and Warren, had brought along the caretaker of the property, Mr. Hollins, who indicated that there might be bulls wandering the pasture where the cemetary was. Given that I don't relish the idea of being gored, I started to get a little nervous. It really did begin to feel like we were heading into the middle of nowhere. The roads in the county were, from what the historical society guys said, the same old roads that were used hundreds of years ago, but were just now paved over. We passed a few small named chunks of land which we presumed were old plantations as well, adding a little historical charm to the trip. Of course, all the speed limit signs shot full of buckshot counteracted that a little. We ended up on Rt. 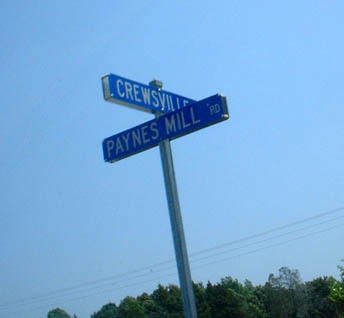 661 which was also called Paynes Mill Rd, and wound down it for a few miles until we hit the intersection of Paynes Mill and Crewsville, then headed south towards the river. After another mile or two, we ended up at a gate to a large farm and pasture which we could see easily covered several hundred acres. 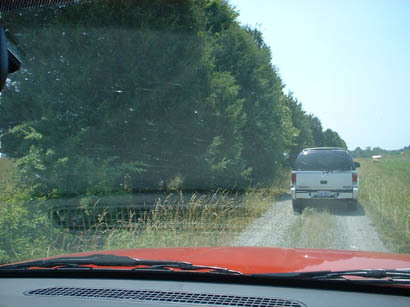 Mr. Hollins got out and opened the gate and we drove on through down a gravel road, along a series of trees. To our right were fields and the occasional little house, but nothing much else. We ended up down near another gate, which Mr. Hollins let us through as well, and we continued down on the grass, passing another row of trees which this time clearly hid an old house that was having work done on it. 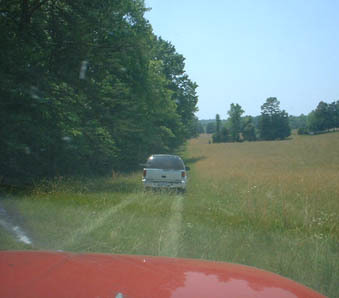 Through this gate, we were off any kind of gravel road and were just driving along the grass for a while. The fields to the right looked pretty clearly like overgrown pastures, and there were a few small, old structures in the distance. 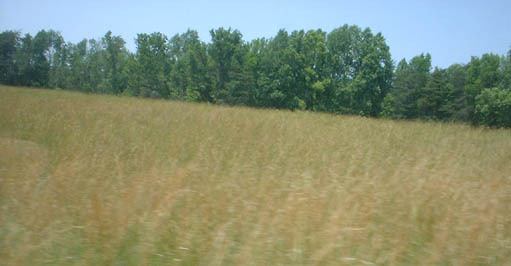 The fields to the right of us were rather tall grasses, and frankly I wasn't sure where we were headed. 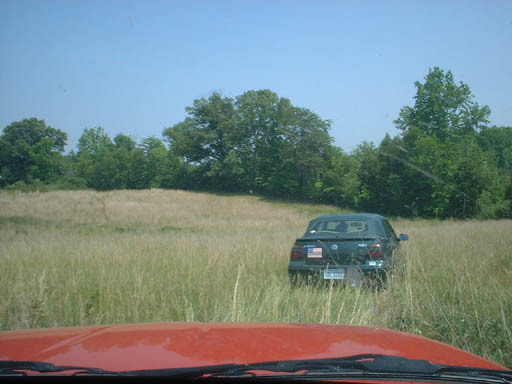 Then, our little caravan went off of the short grass and into the long grass, and I was happy we'd rented an SUV instead of a sedan like we'd initially planned. 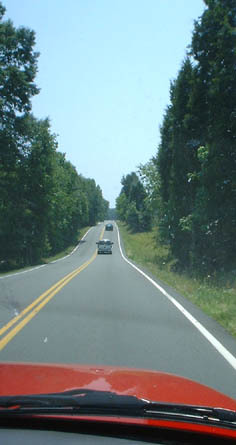 We drove up a little incline and saw we were clearly heading towards a big tree. 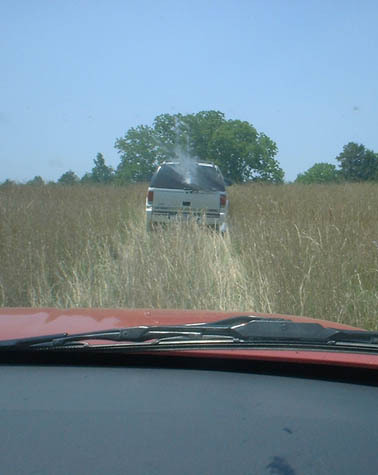 Eventually we cleared the tall grasses and ended up at the grave site. 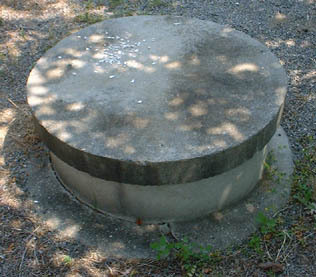 It's not in very good shape other than the monument which my father's Uncle Robert had made in 1969. As you can see from the pictures, the trees are somewhat overgrown and one branch is dragging on the ground. What you probably can't see are all the cow pies from where the cows around have done their, uh, business. But, like I said, the monument is there and still looks wonderful. 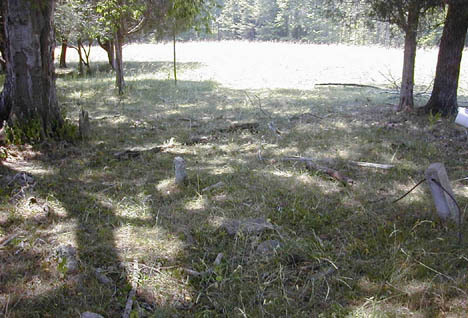 Originally, metal cabling stretched out through the monument and through four corner posts to block off the grave site from the cows. But it had rusted out and snapped some time before, leaving the cows free reign on the gravesite. 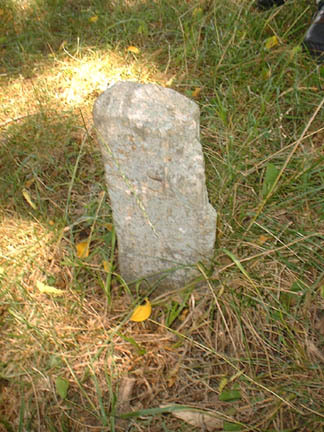 Whether due to the cows or erosion due to the natural limestone that the headstones were made out of, none of the headstones survive completely intact and only one still even really resembles a headstone. In the picture above, you can see it a little left-of-center, and then there's a closeup shown below. 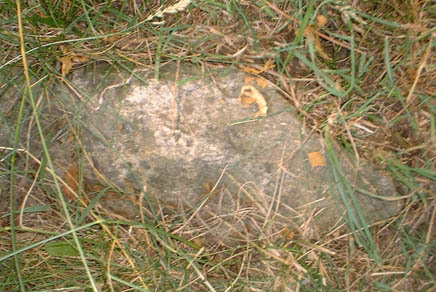 We're not completely sure of the orientation of the graves (the map that Uncle Robert had reproduced from Mabel Ruth Duncan's papers has some major inconsistencies to it), but it appears to me that this is probably the headstone of "Aunt Betsy," Elizabeth Edloe Duncan, daughter of Robert Duncan and Rebecca Bacon. Or perhaps it's Rebecca's? We're not sure. 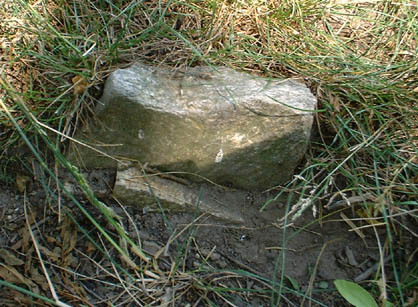 Other remnants of headstones are in the ground (such as the ones above), but are hard to identify. 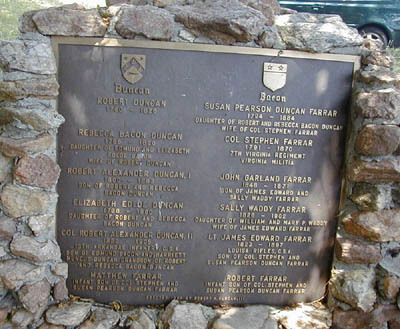 The one above probably belonged to one of the Farrars (Susan Pearson Duncan Farrar, daughter of Robert Duncan & Rebecca Bacon; Col. Stephen Farrar, Susan's husband), but again, we're not sure of the true orientation of the graves. 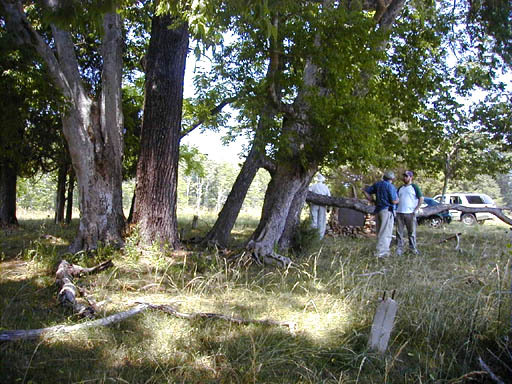 As you can see by this picture (that's me above, talking to cousin Warren over by the big long drooping branch), a number of trees have grown up in the plot. 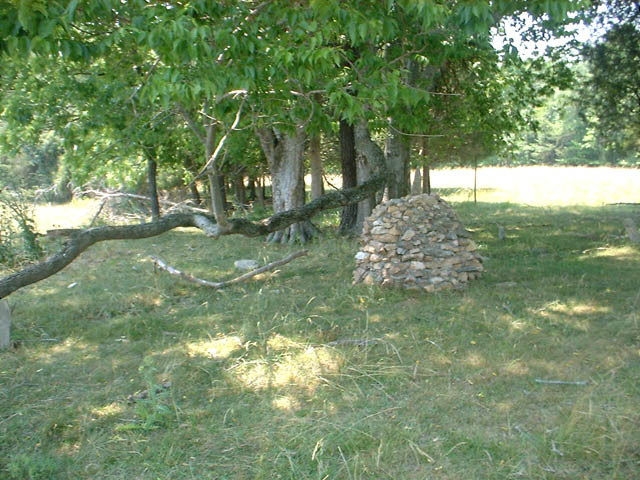 At least one of these appeared to be a walnut tree, and there was a walnut tree which originally stood at the edge of the plot according to the notes of Mabel Ruth Duncan. But, unfortunately, that doesn't really help situate the rest of the map as if that was the location of the walnut trees that Mabel Ruth described, then the house would be in a completely different place (more on this later). This large tree appears to be very old, and has one huge drooping branch which is slowly digging its way into the ground as the wind blows it around. 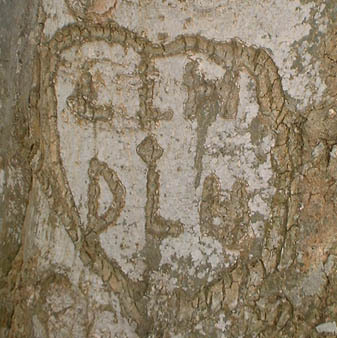 It also has a big carving on the side of it which seems to read either "L. L. H + D. L. H." or more likely "L. L. W. + D. L. W." Our cousins informed us that the "D. L. W." was probably their cousin Duncan Livingston Wingfield, as it seemed like something that he would do. The "L. L. W." (or "L. L. H."? "L. L. M."?) is unknown, and were not the initials of his wife. 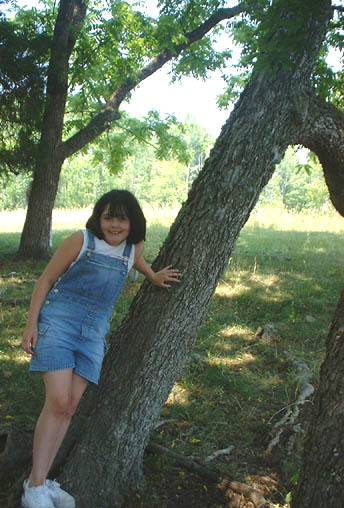 As you can see above, the tree also provided a much needed play area for one of Robert Duncan and Rebecca Bacon's great-great-great-great-great-granddaughters. We started to get a little tired, so we hopped back into the cars and drove up to the house which we had passed earlier. 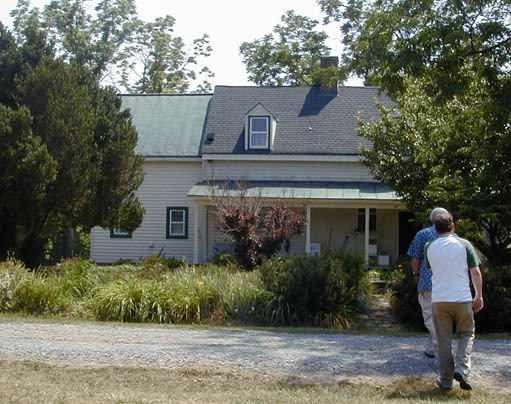 Now, in "Old Home Places of Louisa County," a local history book about As we approached the house, it was clear that this was the same house as shown in the sketch in the "Old Home Places of Louisa County" book. 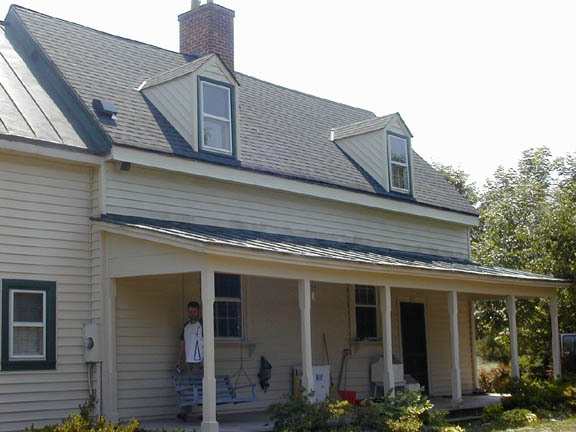 There have been a number of additions to the house, but the structure is clearly the same. The owners weren't home, but some guys were there roofing the house and we introduced ourselves and talked to them a bit. They claimed that the insides of the house were very old, and seemed to think that a building date of around the 1780s or 1790s was within reason. They claimed that there were some old, very worn staircases, and that the chimney which we saw from the outside was actually a newer cover to a much older stone chimney inside. 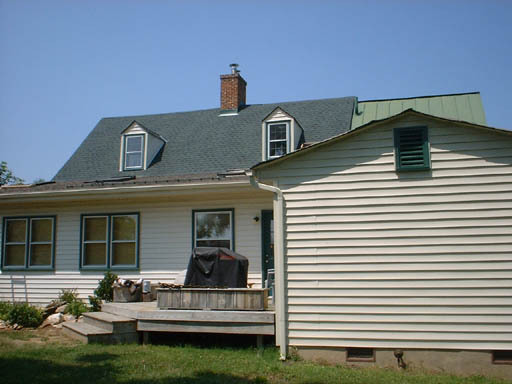 The house has a weird design for the time, and one of the clearly strange things about it is that the chimney is smack-dab in the center of the building. 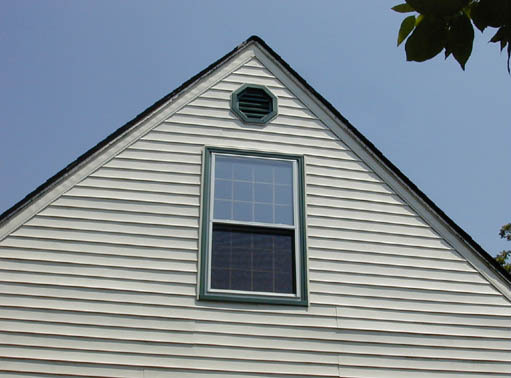 Looking at the front of the house, you can also see that the front door is not centered, and is placed on the center of the right-side of the house. It seems plausible that the right half of the house was the original house and the left side was added on later. 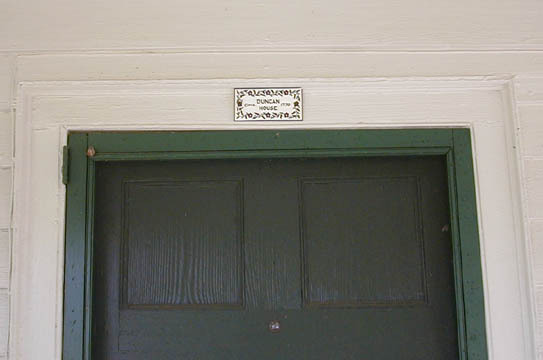 Obviously, as you can see above, the current owners believe that they're living in the "Duncan House." And, other things around the land (such as the capped-off well in the front yard) seem to indicate that the house is pretty old. Sometime in the past few decades, a new section has been added to the back, along with a deck and a new shed (or maybe garage?) was built in the front yard. 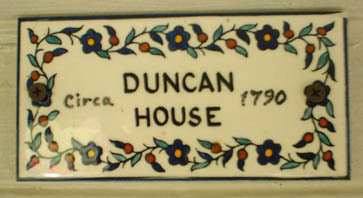 It's a beautiful house, and one which I think should be considered a historic place if it truly is the Duncan House. It certainly is the same house as the one mentioned in the "Old Home Places" book (a picture of which is on the main page of familyduncan.org), but I've still got a few small doubts as to whether or not it is really the house -- Doc believes that the house is too small to hold as big of families as there were in those days, but I don't think that's a very persuasive argument. Rather, what worries me are the inconsitencies in the orientation of the grave site and the directions printed on Mabel Ruth Duncan's map. According to her papers, the home was in the same direction as the river end of the plot, making it in the opposite direction of the home that we saw. But, would this make any sense? Wouldn't one want to put a house on higher ground and not so close to a river? I tend to think that either Mabel Ruth Duncan was in error, or Uncle Robert somehow transcribed Mabel Ruth's document incorrectly. Yet, Mabel Ruth was born in the house, grew up on the land, so I'd think her notes should be taken at face value. 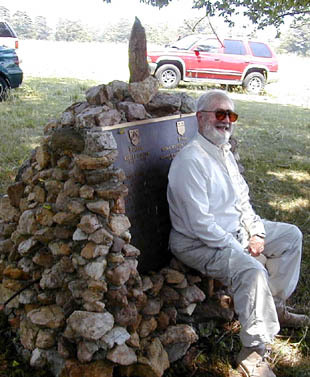 The orientation of the monument would seem to indicate that Uncle Robert had the monument placed at the "head" of the plot, which seems to fit the orientation of the headstone remnants we found. But, doesn't match any of the current flora noted on the map (which makes sense, the map is 100 years old! ), but also doesn't match the location of the river or the location of the house. I can't seem to come up with an orientation that works. At any rate, it was a wonderful trip, and I hope we can go down again soon. I also hope that we can encourage other descendents of Robert Duncan and Rebecca Bacon to help with cleaning up the grave site. It's a shame that it's fallen into such a state of disrepair, but if the descendents of Robert Duncan and Rebecca Bacon can arrange with the current owner of the land to fix it up, I think we should make the effort to do so.